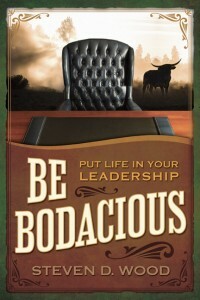 I’ve been reading a copy of Be Bodacious: Put Life in Your Leadership recently, and it’s been one of the better business books I’ve read this year. I’ve realized that a good mix of “story” and “lesson” is what I enjoy in a book. While there are a lot of good picks out there, a good book needs something to tie it all together and make it stick. Do you have a “chicken catching” job? Who couldn’t love a book with metaphors like that? The basic story isn’t too far off my own. Young guy making very little in his first “real” job. Wife and family to take care of. Surrounded by people who are okay settling for whatever they get. Willing to look beyond the horizon to bigger and better things. It’s possible to kill a dream. “If yo uremain complacent and deny your dreams of yourself, after a while the fire of your big dream will dim and eventually be extinguished.” (p.47) That’s why I push for boldness whenever I can! Change-(the cat’s meow) the cow’s moo. There’s a page or two comparing leading a change initiative to herding cattle. It’s a fantastic metaphor, but I don’t want to pull all the good pieces out of the book. :-) You’ll find it on page sixty, and it’s phenomenal. Stay tuned. I have about five more pieces I’d like to add here, but they’re a little more in-depth, so I’ll save them for a later post. Suffice to say that I have a boatload of new ideas from this thing! The book needs another run by a proofer/editor to clean some parts up grammatically and for wordiness. Otherwise I have nothing negative to say. It had some great points and made another business/leadership book I was reading as a homework assignment (for my SHRM chapter’s mentor program) pale in comparison. I’ll be emailing this book review to my department later this week. Why? Because we all could use a little more extraordinary, unrestrained, and bold action in our lives! If you like a good story with some great lessons on leadership and managing people, then I think you need to get a copy. Be a chicken eater, not a chicken catcher. Keep moving toward the horizon with boldness. And for gosh sakes, be bold! Two quick notes: thanks to Trish for the shout out in her Top Summer Reads for Business Leaders post, and feel free to click this link if you’re looking for other book reviews I’ve done in the past. This book focuses on leadership and how to develop a strong, lifelong attention to leading others in the “right” way. Good tips and ideas, but nothing world-changing. This entry was posted in General, Video and tagged Boldness, Book Review, Leadership, Passion, Video on July 28, 2010 by Ben. What a great book review! Catching chickens is an even better simile than herding cats. Thanks for sharing the raining poop imagery. .-= working girl´s last blog ..August Leadership Carnival =-.